"This is an utterly simple dish that's great for getting rid of all that extra rhubarb! Any fruit can be used, not just rhubarb. Just substitute sweetened fresh fruit or a can of pie filling. Serve with whipped cream." In a medium bowl, stir together 1 cup of sugar and 1 tablespoon of flour. Add rhubarb and toss to coat; set aside. Melt the butter in a 2-quart casserole dish or other deep baking dish. In a large bowl, whisk the remaining 1 cup of flour, 1 cup sugar, and baking powder. Stir in milk until batter is smooth. Pour the batter over the melted butter and spread gently so that butter stays on the bottom. 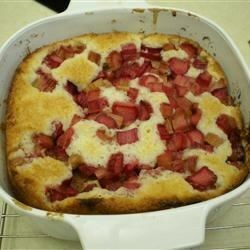 Arrange the rhubarb in an even layer on top of the batter. Bake in the preheated oven until batter has risen up through the fruit and the top is golden brown, 50 to 60 minutes. Test with a long skewer to see if cake is cooked through. Mine did not come out all gooey and carmely on the bottom. It was hard and crunchy on the bottom b/c I had to cook it longer so the cake was done. Not impressed, will not try it again.